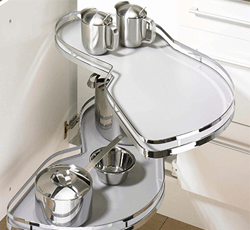 Using clever storage solutions within your cupboards means you get the most out of your kitchen space. With solutions from internal drawers to help you use the whole depth of a cupboard to corner carousels for tricky corner cabinet access, you’ll be able to keep your brand new kitchen neat and tidy. Designed for under sink storage. Basket comes with adjustable partition and full extension slides. 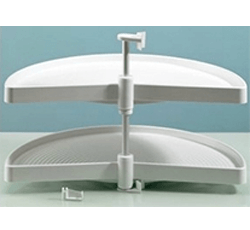 Size: 100mm H x 485mm D.
Minimum internal clearance of 120mm required. 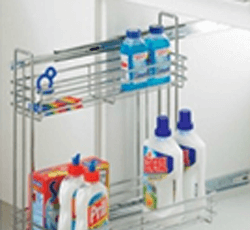 Ideal for use under sink for storage and cleaning equipment. Fitted with soft close feature. Size: 485mm H x 430mm D x 150mm W / 485mm H x 430mm D x 100mm W.
Requires a 450mm W door. Fits in return cabinet. Available to fit drawers in 100mm increments up to a maximum width of 1200mm. 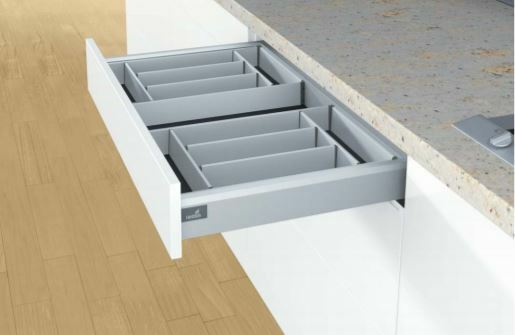 Can be used as an internal cutlery drawer or as a pot drawer with the addition of gallery rails. Suitable for cabinet widths: 300mm/ 400mm/ 500mm/ 600mm/ 800mm/ 900mm/ 1000mm. 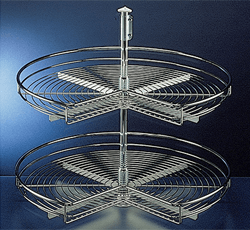 Stainless steel wire basket with removable clear acrylic non-slip base. Weight capacity: 40kg. Lemans Blind Corner Shelf System. Corner pull out for return base cabinet. Requires a minimum 450mm W door. Features non-slip tray.  Fits 880mm base corner cabinet. 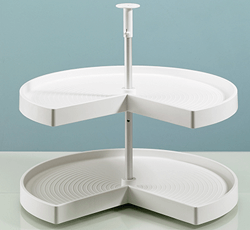 Chrome corner carousel with two independently operating shelves. 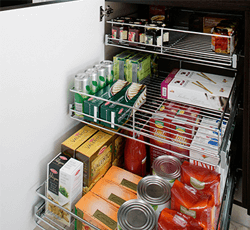 Make your drawers more functional with a range of organisation products for your new kitchen. No longer just for your cutlery, there are a range of solutions for every drawer in your kitchens so your spices, pots, pans and plates are easy to store and access. Size: Up to 900mm wide. Suits cabinet widths: 300mm/400mm/450mm/500mm/600mm/800mm/900mm. Material: 100% recyclable steel. Organise your spices within easy reach of cooking spaces. Size: Available in up to 600mm wide and up to 1000mm wide. Plastic cutlery tray with variable dividers. Size: 600mm wide Material: Silver surface finish. Includes 1 crosswise rail and 3 org elements. 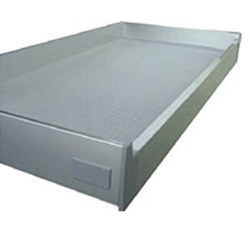 Also available in 800mm/900m/1000mm wide drawers. Fits within drawer to stop items falling between railing and drawer frame. Material: Translucent Plastic. 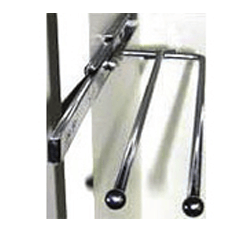 Can be combined with Crosswise railing. 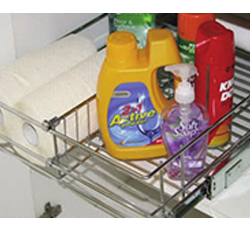 Make the most of under sink space with a pull out drawer. For more visibility into your drawer space and a clean, modern look. 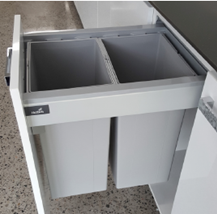 Eliminate the ugly eyesore from your new kitchen by planning integrated or hidden bins in to your design. Perfect for under kitchen sink units. 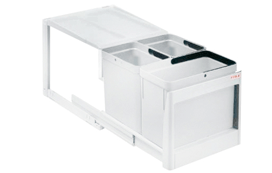 Features a self-opening lid allowing easy access for removal and cleaning. 11 litre capacity. Recycling bins plus waster bin. Can be mounted on a fixed shelf. Available in Grey finish. 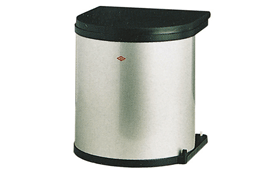 Buckets come with handles, metal lid is part of the system and fixed inside the cabinet.